Carrie Underwood made wishes come true this holiday season for the schools in her hometown of Checotah, Oklahoma with donations amounting to $350,000 through her Checotah Animal, Town, and School (C.A.T.S.) Foundation. 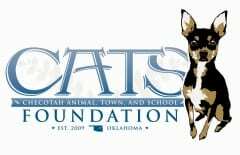 Each of the four schools – Marshall Elementary, Checotah Intermediate School, Checotah Middle School, and Checotah High School – learned that they would receive the necessary funds from C.A.T.S. to use on new computer labs for each school, playground equipment, physical fitness equipment, as well as new band uniforms, furniture, storage, instruments for their music programs and more. “We are so proud of Carrie and her accomplishments and we appreciate everything she has done for our students. Every student in our school will benefit from the C.A.T.S. Foundation’s generous donation,” shared Toni Brown, Assistant Superintendent of Checotah Public Schools. In addition, this past October, Underwood’s C.A.T.S. Foundation partnered with national non-profit organization KaBOOM!, and with the help of over 200 local volunteers built a playground in one day at Marshall Elementary School designed by the school’s students.